If you move every few years you find that there are a few things that really make you feel like you are home. The unpacked boxes can be blocking a doorway or stacked by the wall so you can get to the bathroom. But there are a few things that make you feel comfortable. Things that say, this is home. For me the first thing is the books. Margaret and I have so many books that if we don’t get the shelves up and the books unpacked we won’t have a living room. When that’s done usually in the first three days; a whole new sense of home has been established. 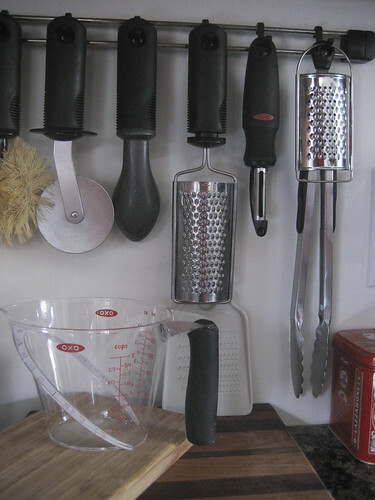 The second thing is the OXO utensil rack. I know that may seem silly. But if I know where it hangs it means that I understand how the kitchen will be situated. It is the first piece in the organizational puzzle that allows me to fill the cabinets with food and dishes. It establishes where the cooking oils and spices will reside, where the cutting boards will be stacked. There is an amazing sense of order and beauty in everyday things. This entry was posted in feature, talking and tagged comfort, home, objects, sense of place. Bookmark the permalink.